Heat naturally flows from a warmer area to a cooler one. It does this in only three ways: conduction, where heat is transferred directly from mass to mass; convection, which is the movement of heated air from one space to another, like forced air systems; and radiation, which simply means that any warm body gives off heat toward a cooler one. 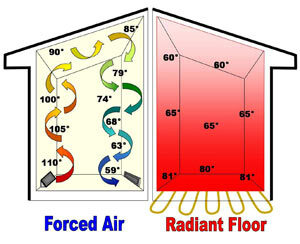 Radiant Heating systems warm the floor, furniture and walls and they disperse the heat evenly into the room. What Does Radiant Heat Feel Like? When you stroll along the beach on a sunny day and feel the warm sand underneath your feet, you're feeling radiant heat. Hold a mug that was warmed because of the hot drink inside, then you're feeling radiant heat. When you stand outside on a cold day and your feet get cold, they aren't absorbing the cold, your feet are radiating your heat into the ground. We are natural radiant heat producers. Objects absorb radiant heat until they are the same temperature as the heat source, then the heat slowly escapes to the closest, colder masses. How Does Low-Voltage Radiant Heat Work? In our safer low voltage system, line voltage is converted in the control unit to between 8-30 volts of electricity and this low current is then sent through the heating element. Resistance in the element creates the heat at controlled temperatures. The low-voltage elements we utilize are Heatizon’s ZMESH or TUFF CABLE, depending on the installation. The heat created then radiates from the element through the floor and continues to warm other objects in the room: tables, chairs, walls and you. None of the heat produced is wasted by leaving the home or building before being fully utilized. What Makes Low Voltage Products Different From All the Rest? ZMesh is a bronze screen in either 9" or 12" widths that is rolled out on the floor in bendable loops. It can be nailed, stapled or glued down. It is designed to be installed directly under any type of hardwood, carpet or linoleum flooring. You can use wide or short plank woods, exotics or engineered. Even better: the Zmesh element can be directly nailed through without any effect to the system. The 9" Zmesh is also exclusively under shingles or non-metalic roofing for snow or ice melting. Tuff Cable is a insulated, stranded copper cable that has one of the lowest profiles available. Install it directly under your tile or attach it to the reinforcement mesh in the newest indoor floor surface, polished concrete. This same great element also installs outside for snow and ice melting in concrete, asphalt or under pavers. Tuff Cable is also the only approved, under-metal roof heating element on the market. Reliabilty against all others. Unlike hydronic systems, there are no furnaces to maintain, pumps/mixing valves or switching solenoids to wear out, water line fittings to leak, hoses that can crack or can be punctured. The entire low voltage system is state-of-the-art and has no moving parts to wear out. Line voltage radiant systems come with a lesser warranty and, if damaged are difficult to trace and lose their warranty if you are able to find and repair them. The low voltage controls allow for power failures and spikes and will shut themselves down. Then, bring the system back online as quickly as possible. Most important, both Zmesh and Tuff Cable elements are easy to repair in the event of damage. All of our Heatizon heating elements carry an industry exclusive 25-year non-prorated warranty. Comfort of our radiant heating system is superior because the radiant heat flux is uniform throughout the heated space. There are no “point of source” hot spots like there are in hydronic radiant and forced air systems. Thermal comfort is sustained as the system cycles on and off because the heated mass temperature remains almost constant. Convenience of installation is superior to any other system. There is no ducting to deal with and no lost floor or wall space. Other than a thermostat, Comfort Radiant Heating systems are out of site. Retro-fitting is easy. Adding the system to an existing space is much easier than installing a hydronic or high voltage heating system. Safety is a major advantage of this system. All of our products utilize low voltage and are ETL listed to UL standards. Quiet and clean. The Comfort Radiant Heating system produces no more noise than a light fixture. There is no fan starting or stopping, no filter to change or clean, no valves to wear out, and no pipes to rattle. Can the system be set up in zones to save me money? Yes. In fact, low-voltage radiant heating is based on true independant zones controlled by their own thermostat. You don't need to warm up 200 gallons of water to 180 degrees, then lower it to 130 degrees (a major waste of energy) just to heat your bedroom at night. Setting the system up in zones saves you money because you can choose to regulate the temerature in each zone independantly. You can heat a small bathroom that has 15 square feet of exposed flooring or a 600 sf Great Room, eat-in area and kitchen as a single zone. Neither of which will cost you anything if it's not calling for heat.